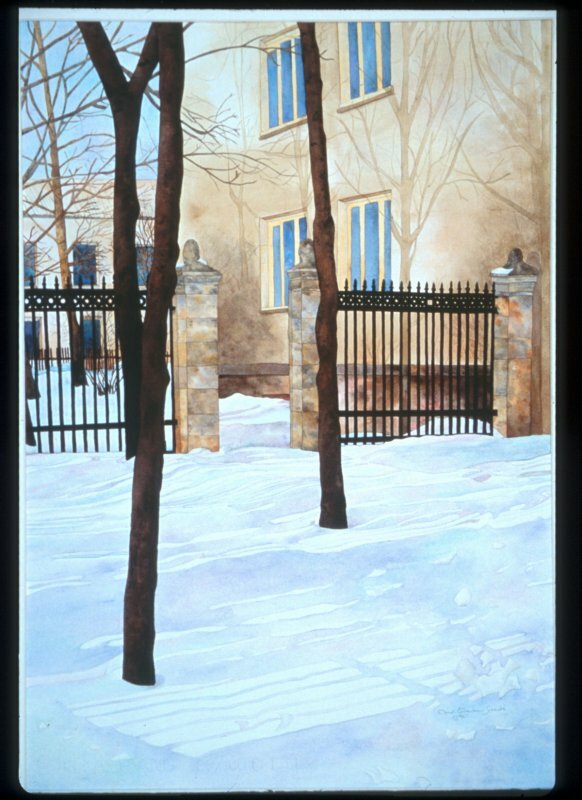 "Down the Hill -- January"
The view from a window of my former house in Arlington, Virginia. 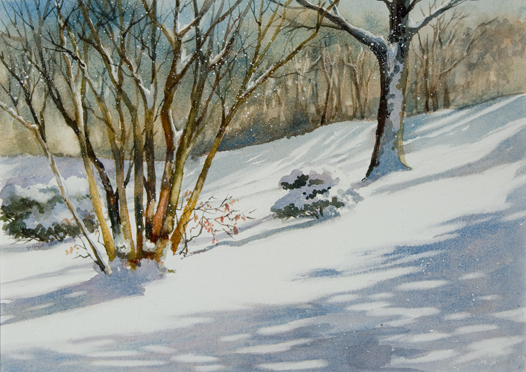 I was drawn to the warm tones of the winter Crepe Myrtle contrasted against the cool shadows on the snow. This is the view from the back of my son's house, to the west, and is the western sky lit by dawn. This part of Alaska, far to the west and close to the Bering Sea, is very flat and treeless. In the winter they still get a few hours of sun, but the sunrise is very slow and the arc is low in the sky. This is an old farm house no longer standing in a cornfield. My old photo didn't include geese, but that is a familiar sight around here. 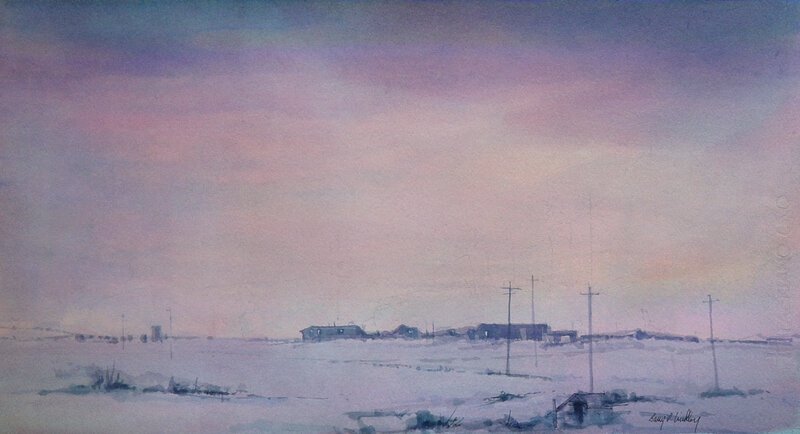 I used a limited palette of burnt sienna and Winsor Blue Red Shade. 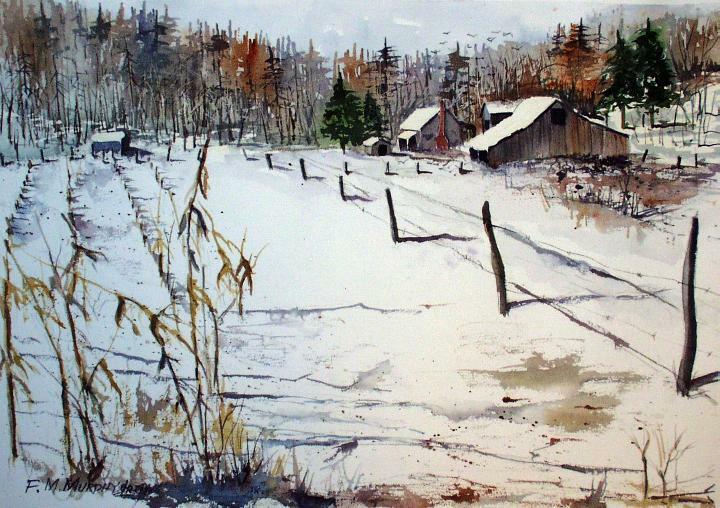 Inspired by visits to Vermont. The image is used as my Christmas Card this year. Photograph taken through glass at exhibition where it was sold as I had neglected to do that. 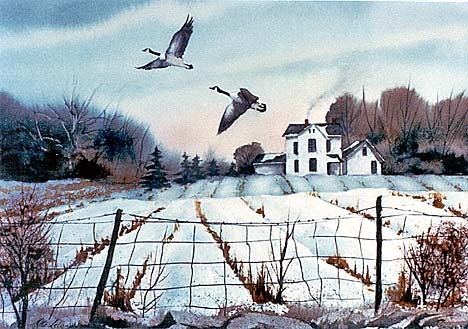 "Yellow Sky in the North Woods"
A scene I made up from memories of the north woods in winter. I tried to use a stylized approach with simple shapes. This sight of the mountain village where my mother was born brings back a lot of memories. This is the 2009 version of the schoolbus painting I do each year for a bus company to make prints/cards. It's always fun to come up with a new angle. A painting I did last year. I was driving in my car when I saw this scene and immediatly tried to put my impression on the paper when I got home. Well, I'm relatively happy with this. I've been viewing this months submissions from the sunny Caribbean beaches of Mexico for the last 10 days. 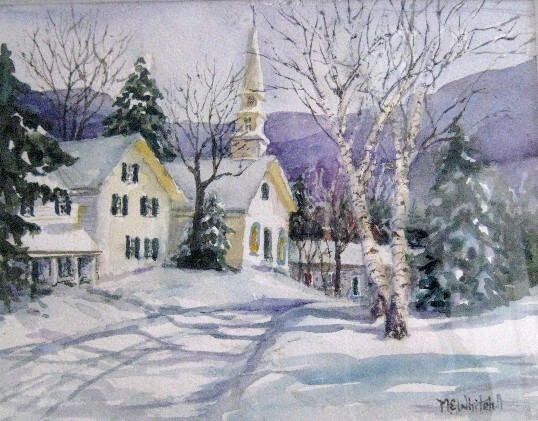 I'm back and it's bitter cold here with some snow so this painting came naturally. No paticular scene and I don't care to see one in person either. Winter is NOT my "cup-o-tea." Great stuff though everyone!! 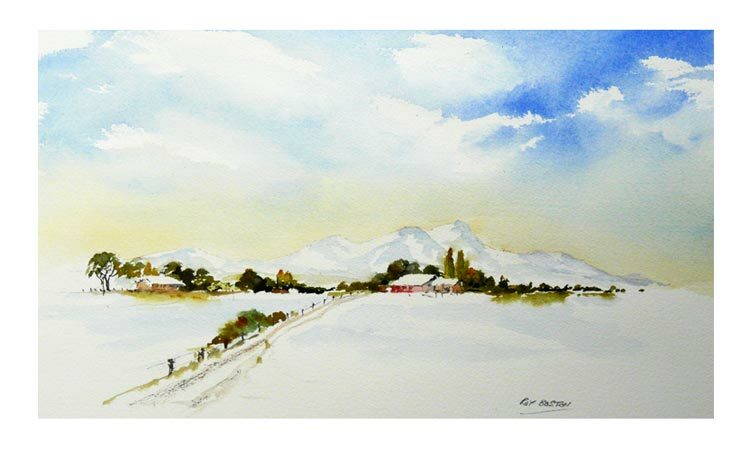 "Winter in the Back Country"
A picture from memory - Painted this morning to meet the Aquanet deadline - we are just starting summer here in New Zealand! One of my very first attempts at wc. It was at a friend's home in Vermont about 10 years ago! I loved the way the shadows undulated on the snow. 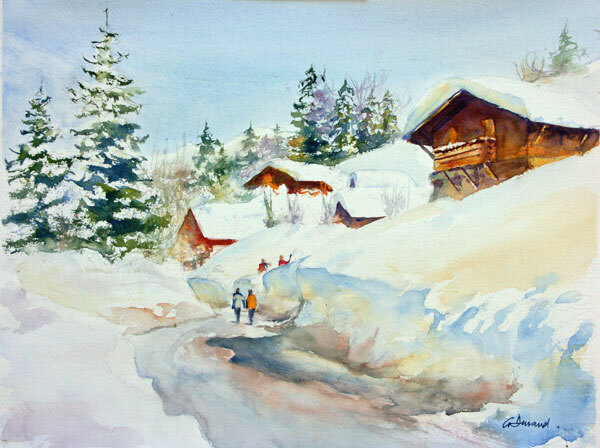 Wish I had a better, more recent snow scene -- all of the entries have been so delightful. I was attempting to capture the beauty & clarity of the waterway on a day that promised Spring was just around the corner. No time to paint a new painting. 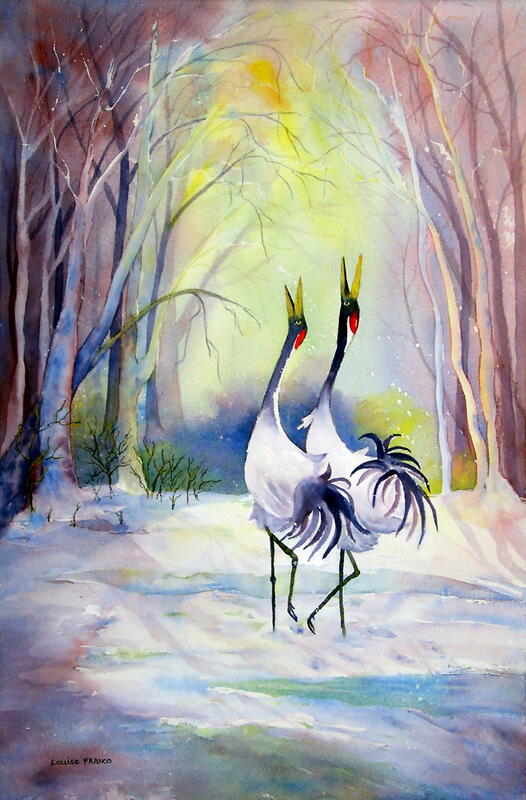 This rendition of Japanese Cranes was completed after a workshop with Lian Zhen. Lots of pouring,lifting out and dropping paint in. A fun project. 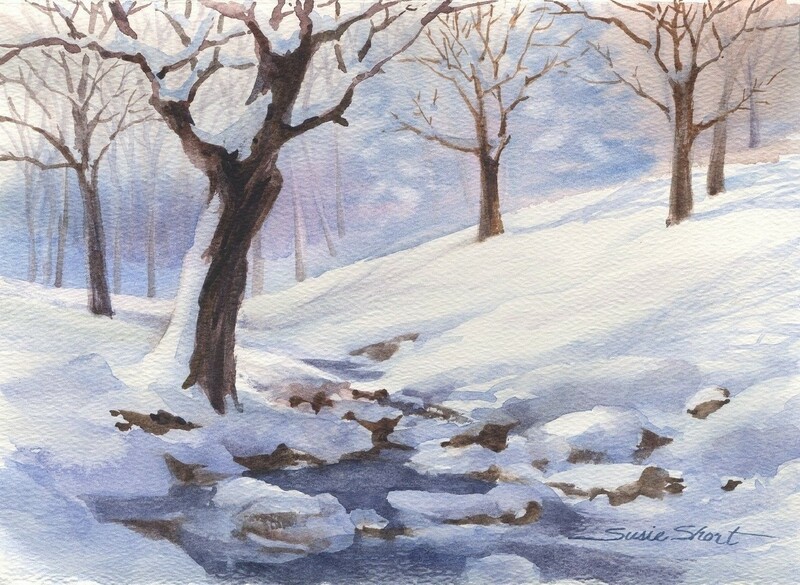 The painting was done from my memories of various winter scenes I've seen over the years. Happy Holiday & Happy New Year from Sunny but, cool Florida. 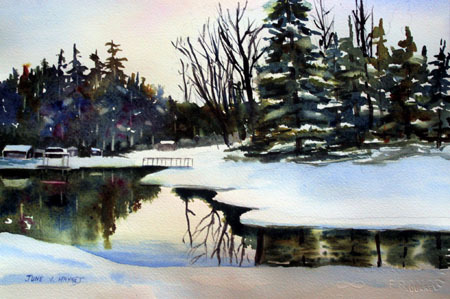 Snowy winter landscapes are some of my favorites. This is painted from memory. It doesn't snow very often in my part of Texas, but one year we had the most spectacular snow fall to usher in the New Year. Fortunately, I had a friend with a 4-wheel drive to take me on a ride to see the sights. The snow only lasted 24 hours then it was gone. :( But I do remember it vividly. Merry Christmas Everyone!